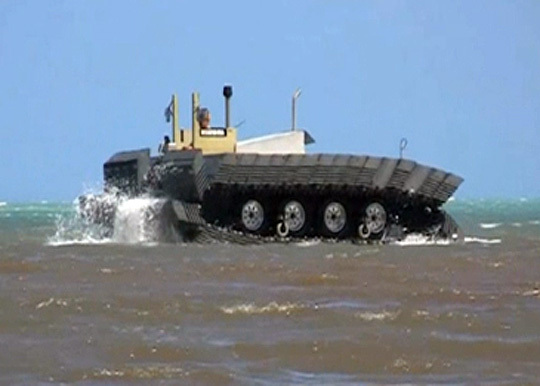 The vehicle has air-filled pontoons on a tank tread-like drive that can carry containers off a barge, over water, and directly onto the shore. The air-filled pontoons on a tank tread-like drive system is simple and robust enough that it can easily navigate over debris on land and floating in the water. And, the 4 tonne vehicle has the capacity to carry containers off a barge, over water, and directly onto the shore. The use case is to support disaster relief operations by transporting medical evacuation and relief care to areas made inaccessible by road. Since most densely inhabited areas in the world are accessible by water, this machine is intended to enable commercial container ships to become self-contained floating supply bases able to operate without the need for port infrastructure. The efficiency of this design is unknown, however, its likely quite low especially in the water. I hope it inspires a scaled down pedal powered design an enthusiastic builder out there!